Now that Mothers Day has come and gone it is now time to start thinking about what Fathers Day gift you will getting for those special fathers you have in your life. 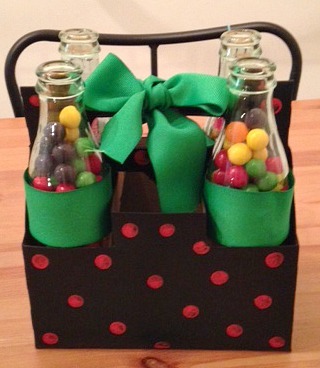 My favorite type of Fathers day gift is a DIY gift especially if they are ones that I can involve the kids with. So after searching Pintrest for ideas I found a Fathers Day gift that really works for anyone at any holiday, so it is so easy to personalize to the specific person it is being made for. 1. The very first thing you should do is empty the bottles, whether it be drinking it or dumping it out, whatever works best for you. Then clean the bottles, I just stuck mine in the dishwasher. 2. Paint the box with your base color. 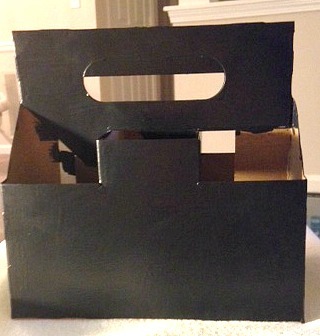 The box I used was pretty slick so I had to do a few coats to make sure none of the background showed through. 3. 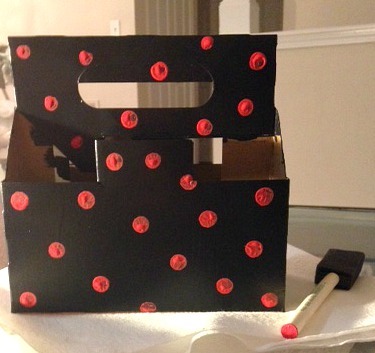 Next I took the back of my paint brush and used my second color of paint to add polka dots. 4. Once your bottles are clean and dry you can take your ribbon and glue a piece around the bottle, I did this mainly to cover the label that I could not remove from the bottles. 5. Fill the bottles with the supplies you chose. I went with different kinds of candy but some other ideas could be notes from you and your children, daddy daughter date ideas, office supplies, or really anything that the desired recipient would like and that can also fit inside the bottle. 6. Add any finishing touches, like the green bow I added. Another thing that you can do that I wish I had done is put the tops back on the bottles, I think it just gives it a great finished look. That is it! This Fathers Day gift is super easy, quick and inexpensive. It would also be an easy gift to make with the kids no matter what age they are. I also love how there are so many ways to personalize it to any individual. Would you make this gift? 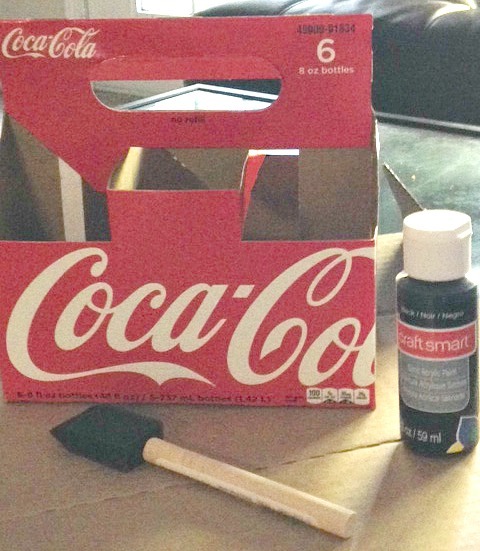 What other DIY Fathers Day gift are you thinking about making? Check out these 10 more DIY Father’s Day Gift Ideas. « DIY Play Snow- Perfect for hot summer days!